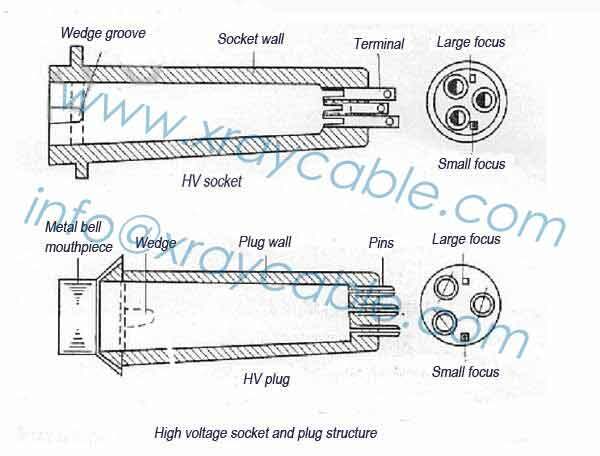 The plugs and sockets of high voltage cables are working under high pressure, and their pressure resistance is very high. Therefore, the pressure plastic materials or rubber, which have high mechanical strength and good insulation properties, are used to suppress the pipe shape. For the convenience of maintenance, the products of each factory are IEC9 (International Electrotechnical Commission) standard. There are three copper terminals on the bottom of the socket. The upper end of the wiring terminal is drilled with a circular hole about 1cm depth to connect with the plug of the plug. Three copper cast pins on the floor of the plug are cast, and the pins are drilled with lead holes so that the cable core wires are introduced into the slot groove. The plug top is inlaid with copper bell mouthpieces to weld the metal shielding layer of the cable so that the shell of the high pressure generator and the X ray head is connected reliably to the ground.